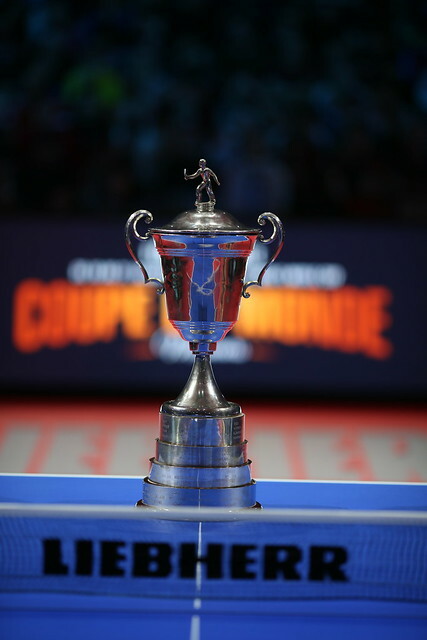 Listed in top spot on the current world rankings, the top seed at the Liebherr 2018 ITTF Men’s World Cup; on the late afternoon of Sunday 21st October in the French capital city of Paris, China’s Fan Zhendong underlined the reasons why he holds the prestigious positions. At final hurdle in the splendid setting of the Disney Arena, he beat Germany’s Timo Boll, the no.2 seed (11-9, 11-5, 11-6, 9-11, 11-8) to arrest the title. Urged forward by the Parisian crowd, Timo Boll made an electric start, he won the first three points of the opening game but then Fan Zhendong responded; he clinched the next five, eventually securing the game by the minimal two point margin. Throughout, Fan Zhendong directed a high percentage of his first attacking strokes towards the body of Timo Boll, well aware of the German’s famed forehand top spin; the first game secured, arguably more relaxed, Fan Zhendong, illustrating the benefit of having strong legs, secured the second in a rather more comfortable manner. Powerful, potent with the first attack, in the third game Fan Zhendong went ahead 4-2, Jörg Rosskopf, the German national coach sitting courtside, called “Time Out”. A necessary break, Fan Zhendong was gaining momentum but just as Timo Boll received advice, so of course did Fan Zhendong from Wang Hao, the Chinese national coach. No doubt from both camps there were well merited words of wisdom but Fan Zhendong was the greater beneficiary; the game was secured, the top seed was one step nearer the avowed goal. Bravely, positive, Timo Boll fought, he secured fourth game by the minimal two point margin after having gained a 10-8 lead. The crowd responded, was a historic recovery in the offing? Motivated by the success, in the fifth game Timo Boll went ahead 4-1; Fan Zhendong responded to level matters at 5-all, before moving ahead 8-5, Timo Boll won the next two points, Wang Hao called “Time Out”. Timo Boll levelled at 8-all, before at 10-8 Fan Zhendong held two match points. He converted at the first attempt and thus maintained his perfect record against Timo Boll, it is now four wins from four confrontations. It was for Timo Boll, in what is now his 15th appearance in Men’s World Cup tournament, the sixth time he had appeared in the final and the seventh time he had concluded matters standing on the podium. On debut in 2002 in Jinan, he emerged victorious, before regaining the title in Liège in 2005; most certainly Liège has been a favourite destination, in 2008 and last year he was the runner up. Also in 2012 in Liverpool, he finished in the silver medal position, having two years earlier in Magdeburg concluded matters in third place. Meanwhile, for Fan Zhendong, he was appearing in his third final in three excursions; in 2015 in Halmstad he was the runner up, in 2016 in Saarbrücken, the winner. Now once again in Paris, he was the winner.